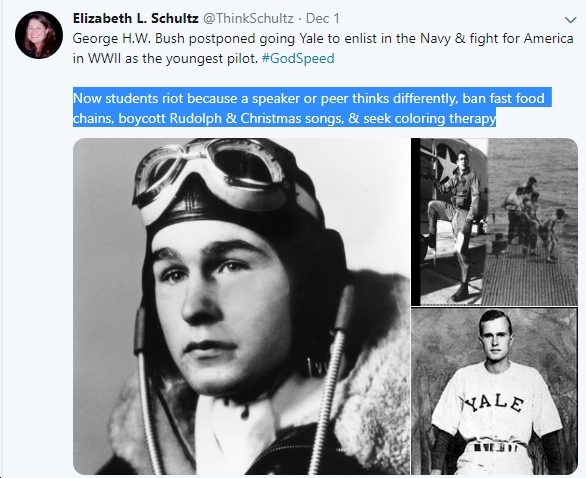 “I don’t know if I’ve ever seen a sitting school board member trash students before.” Far-Right, Anti-LGBT Fairfax County School Board Member Elizabeth Schultz Says Today’s Kids Are Far Worse Than George HW Bush. We’ve followed the illustrious career of far-right, homophobic, off-the-rails Fairfax County School Board member Elizabeth Schultz (R-Springfield district, Fairfax) for some time now. For just a few examples of how godawful Schultz is, and why she must be booted off the School Board next November, see Fairfax NAACP to Far-Right School Board Member: More Police and Guns in Schools Are NOT the Answer, Fairfax County School Board Member Pat Hynes: “more evidence of the need to challenge Springfield member Elizabeth Schultz”, Far-Right Fairfax County Public School Board Member Supports Guy Who Thinks Women Who Get Abortions Should Be Hanged., Far-Right Fairfax School Board Member: Gun Violence Prevention “Not a Job for Traumatized Children” (Audio), Fairfax Dems Vice Chair Open Letter to Far-Right-Wing Elizabeth Schultz, Fairfax County School Board Member to Speak at Anti-LGBT Hate Group Event, Pepe the Frog: Hate Speech Disseminated by Fairfax County Public School Board Member?, Latest Tweets by Fairfax Far-Right School Board Member Feature Fidel, Florence Henderson with Laser Beams, etc. See below for the Schultz tweet that prompted Cohen’s response. Note that there are many ways to serve America without becoming a pilot in a war, although certainly that’s a very honorable thing to do. But what relevance does that have to any of things Schultz’s tirade mentions? Also, seriously?!? How many students want to “boycott Rudolph & Christmas songs?” What exactly is wrong with “coloring therapy” (the relevant question for any type of therapy should be whether it’s effective or not)? And it’s DEFINITELY not wrong to want to get rid of fast food. But again, what on earth is this far-right loon ranting and raving about? And more to the point, why the HELL is she on the Fairfax County School Board?? ?